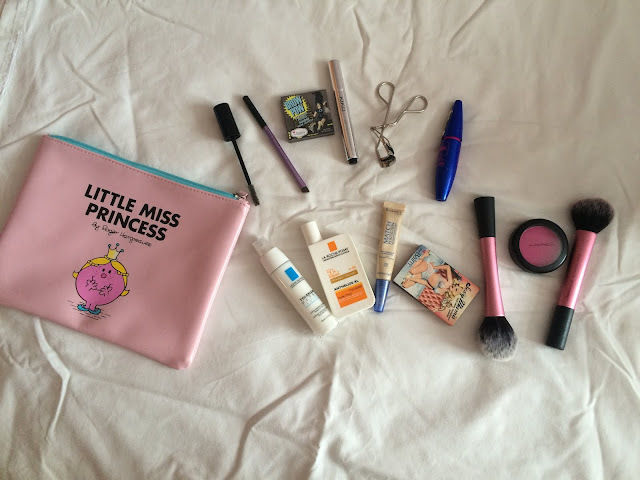 Summer Daily Make up Routine and the Cutest Make up Bag! I got this bag from Amsterdam - Waterstones. 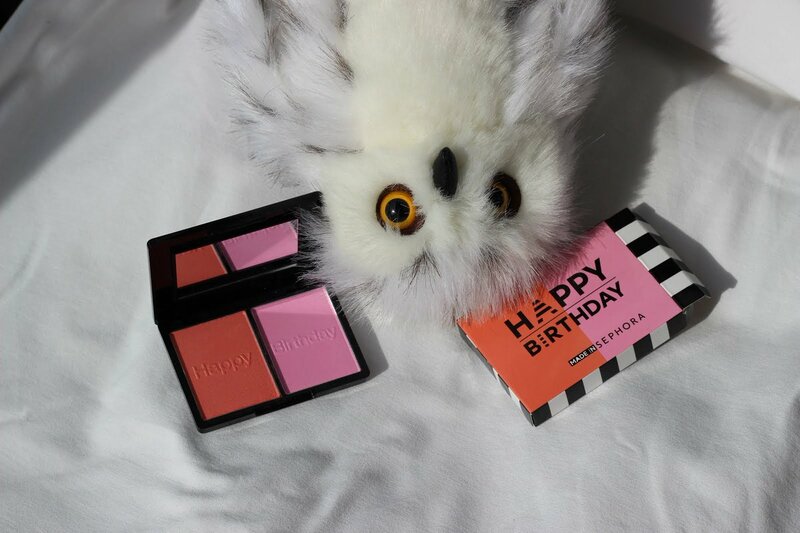 I love it a lot and hence I don't use it. I fear that I'd have make up smudges on that pristine pink. Soo here it makes its debut. I don't like heavy make up anyways. But I tend to use a lot less products in the summer time. This pretty much sums up the everyday products that I use when I go to work. It's nothing WOW, it just makes me look OK.
La Roche Posay Anthelios XL to protect my face from the sun. Even if I'm just going to the office, I always apply sun protection before I leave. Rimmel Match Perfection Concealer to spot conceal. I hate wearing foundation in the summer. the Balm - Brow Pow & Real Techniques Brow Brush to shape my brows. I tend to use an old, clean mascara wand to brush my brows. Shu Uemura Eyelash Curler to curl my eyelashes, duh. Urban Decay 24/7 Glide on Eye Pencil if I need something extra on my eyes that's easy to apply and will give some colour, I'll just draw a simple line with a colour that comes to my hand first. Lancome Juicy Shaker in Berry Tale for a little colour but I don't do this every day. I honestly am comfortable with just lip balm. It seems like there are lots of products here but my daily make up routine with these products is max 15 mins. Bu cantayi Amsterdam Waterstones'dan almistim. O kadar seviyorum ki simdiye kadar kullanmaya kiyamadim. Icine makyaj malzemesi koyarim diye almistim ama icine dokulur/bulasir diye koyamiyorum :D Ilk kez bu post icin kullandim. Hicbir zaman agir makyaji sevmedim zaten, ama yazin daha da hafif urunler kullaniyorum. Bu yazida da herhangi bir yaz gunu ise giderken gunluk makyajimda kullandigim urunleri paylasicam. Bu urunlerle WOW dedirtmek cok mumkun degil, sadece biraz daha bakimli gorunuyorum ve gunu kurtariyorum diyebiliriz. La Roche Posay Anthelios XL gunes korumasi olarak. Sadece evden cikip ise de gitsem mutlaka suruyorum. 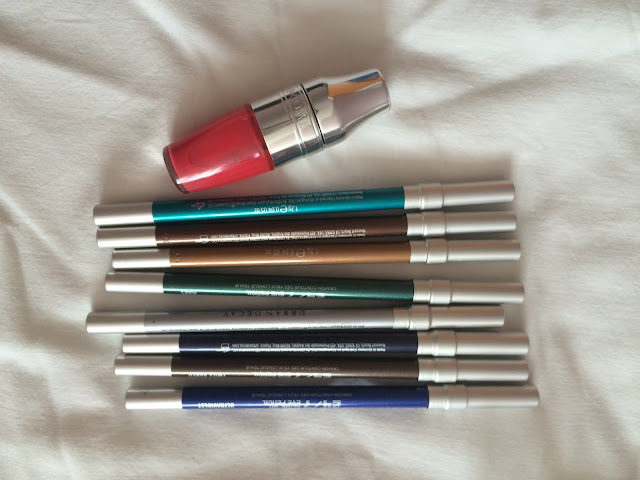 Rimmel Match Perfection Kapatici sivilce ve lekeleri kapatmak icin. Yazin fondoten surmekten nefret ediyorum. the Balm - Brow Pow & Real Techniques Kas Fircasi kaslari kesillendirmek icin. Eski bir rimelimden yikayip temizledigim fircayi da kas fircasi olarak kullaniyorum. Urban Decay 24/7 Glide on Goz Kalemi gozlerde biraz renk istedigim zaman elime gelen ilk rengi basit bir cizgi seklinde suruyorum. Lancome Juicy Shaker in Berry Tale biraz renk istedigim zamanlar bunu kullaniyorum. Genelde sadece lipbalm kullaniyorum. Cok fazla urun var gibi duruyor ama boyle bir makyaj en fazla 15 dk suruyor.